The FBI says it has a new suspect in the D.B. Cooper skyjacking mystery, a daring, decades-old heist that has become a piece of American folklore. In November 1971, a man using the name Dan Cooper boarded Northwest Orient Airlines flight 305, taking a seat near the rear of the Boeing 727 passenger cabin. He ordered a bourbon and water, and lit a cigarette. He then told a flight attendant that he had a bomb, forcing the plane to land at Seattle-Tacoma, where he was given a $200,000 ransom and four parachutes. He released the other passengers; the plane refueled and took off. A little over a half-hour into the second flight, with the flight crew confined to the cockpit, Cooper strapped on his parachutes and jumped - and was never seen again. In the years following the heist, small pieces of potential evidence have turned up in the forests of Washington, in or around the area where it's estimated that he took the plunge, including three packets of the ransom cash and the instructions for lowering the rear stairs of a 727. But of the man who would come to be known as D.B. Cooper, there was not a trace to be found, and now, four decades later, his legend is secure. But the FBI revealed yesterday that it may yet be able to put a name and a face to the country's best-loved skyjacker. "We actually do have a new suspect we're looking at. And it comes from a credible lead who came to our attention recently via a law enforcement colleague," FBI spokeswoman Ayn Sandolo Dietrich told The Telegraph. "The credible lead is somebody whose possible connection to the hijacker is strong, and the suspect is not a name that's come up before." Agents have sent an item belonging to the new suspect to the boys in the lab at Quantico, where they'll hopefully be able to pick up a fingerprint or some other bit of evidence. "It would be a significant lead," Dietrich said. "And this is looking like our most promising one to date." One thing Dietrich wouldn't comment on is whether or not the suspect is still alive, although she did point out that "the large majority of suspects we look into now are already deceased." Special Agent Larry Carr, who spent several years on the case, believes that Cooper died soon after deplaning, because the business suit he was wearing offered no protection against the elements. But Agent Curtis Eng, who's currently assigned to the case, thinks that if Cooper had died while trying to get away, some meaningful evidence, like clothing, money or bones, would have been found by now. And it hasn't. Either way, according to Geoffrey Gray, the author of Skyjack: The Hunt for D.B. Cooper, any new evidence won't be of much value because the evidence taken from the hijacked plane "has proven inconclusive for conclusive testing." "During the three years that I reported on the Cooper case and was given exclusive access to FBI files... I learned through then case agent Larry Carr that the fingerprints uncovered on the plane that night were virtually useless," Gray wrote on his website at huntfordbcooper.com. "There were so many prints for agents to dust on the plane it was impossible to tell which were the hijackers and which were passengers." "Furthermore, the most crucial physical evidence in the case itself - 8 Raleigh filter tipped cigarette butts - had gone missing," he continued. "Carr didn't know where they were, and suspected they might have been tossed because DNA evidence had yet to come in vogue." Despite what the TV teaches us, it actually takes a long time to process evidence and run lab tests, and Dietrich said it could be "some time" before the results come back. And it could turn out to be another dead end, or Gray could be right and there may simply be nothing viable to test against. But maybe - just maybe - one of the greatest crime mysteries of the century is on the verge of being solved. To learn more about the infamous D.B. Cooper case, have a look at the FBI's 2007 case summary D.B. 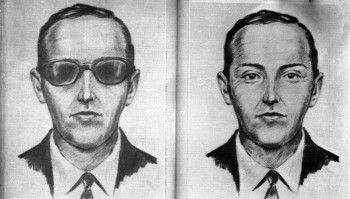 Cooper Redux: Help Us Solve the Enduring Mystery.